The original plan of the Oslo Accords was to establish a Palestinian Authority and within an interim period of five years for Israel, to gradually hand over responsibilities. The West Bank was divided into three distinct areas: A, B and C. Initially the Palestinian Authority had civil responsibilities in area A, which permitted them to have municipalities, police forces etc. These quasi-state institutions did however turn out to be purely symbolic, as the Palestinian Authority has remained completely powerless. More than 60% of the West Bank is still treated as area C, where Israel has absolute military and civil control. The PA has no bearing on whether Israel chooses to demolish a village or cut electricity for an extended period. Nor does it has any say on the free movement of humans or goods within the West Bank and is obliged to “security coordinate” with Israel. Many Palestinian and Israeli intellectuals, including Eid, compare the creation of the Palestinian Authority to the Bantustans of South Africa. The main function of the Bantustans in South Africa and the PA in Palestine is to manipulate the public and perhaps more importantly the international community into believing that there is actual movement towards independence. The glass palaces of the PA in Ramallah are there to give the illusion of a real state with real institutions. The Oslo Accords also redefined the Palestinian people. There are a total of around 11 million Palestinians in the world; the Oslo Accords were however only concerned with the approximately 4.5 million living in the Occupied Territories. The status of the around five million Palestinian refugees living in barely habitable camps around the Middle East and the 2.5 million internally displaced Palestinians was neglected in the negotiations. Within the last decade Palestinian activists have led an incredible amount of non-violent and cultural resistance in cooperation with activists from the international community. 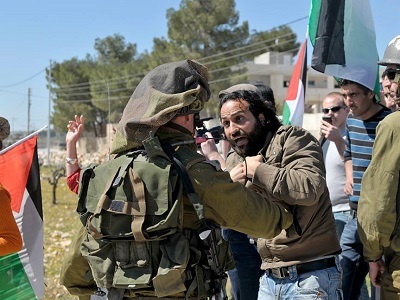 Villages such as Nil’in and Bil’in in the West Bank have continuously held weekly non-violent protests against Israel’s apartheid wall, which stretches 742 kilometers through the West Bank and the expansion of the settlements. In 2009 an initiative called the Gaza Freedom March gathered 1,200 activists in Cairo planning to break the siege of Gaza by foot. The Egyptian authorities prevented them from doing so, but they decided to camp in Tahrir Square to protest. Two years later Gaza hosted, for the first time, the International Festival for Literature. At the moment the BDS campaign is gaining unprecedented momentum: artists, academics and even Western politicians are boycotting Israel and refusing to perform there. These are all valuable forms of resistance, but are not always recognized. -Ebbe Bertelsen is a former peace activist in the West Bank with the International Solidarity Movement and student of political science at Copenhagen University Denmark. In July 2013 he worked with an international media convoy in Gaza. To see more of his work visit click here, and read about the convoy. He contributed this article to PalestineChronicle.com. – Annamaria Bruni (photographer): During a voluntary project with Palestinian Association AIDA, Bruni found inspiration for her latest work on refugees, Profession: Refugees. In 2013, she participated in the “Welcome to Gaza Convoy”. To see more of her work click here. The author uses the word “apartheid” too often, as if trying to convince the reader and himself that it is applicable and appropriate. It is niether. If Israel were truly an apartheid state, there would be no Arab MKs, there would be no Arab owned businesses thriving in Israel. Israeli hospitals would not treat palestinian residents in need of care. Jews would be allowed to pray on the Temple Mount. The examples go on. Are there better ways to deal with it on both sides? Absolutely. But rhetoric such as this does nothing but antagonize. The standards for identifying apartheid anywhere in the world are found in the international Convention on Apartheid; according to that, Israel is practicing apartheid. The South African government commissioned a study of this subject by an international team of legal scholars, who published a 300+ pp report, concluding that Israel is practicing apartheid AND colonialism, both illegal under international law. See a short article on this at the electronic intifada – put “South African Study” in the search box. Also read two good summaries of that 300+ pp report here: http://www.kairosresponse.org. Look in the drop down list under More Resources, and find Israeli Apartheid Report.